Does it exist: staying at an uninhabited island in the Netherlands? 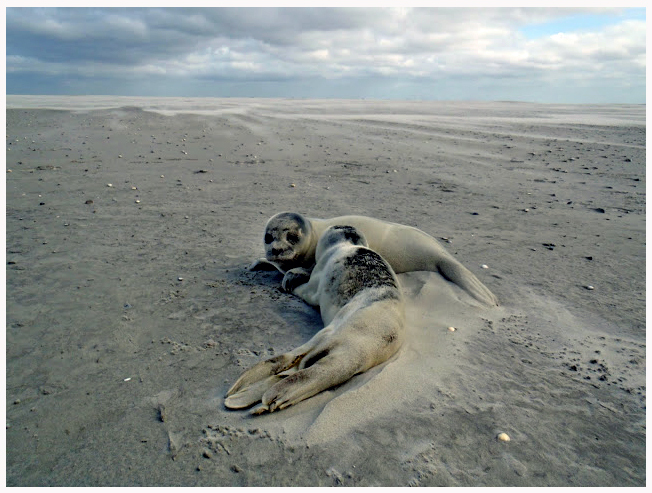 Yes, it exists on the sandbar Simonszand between the islands of Schiermonnikoog and Rottumerplaat! You will find on Simonszand what you are looking for. Unspoiled nature, dunes, a large variety of shells, birds and curious seals. Arrival and departure is at different locations. This requires either transportation by bus, or by private cars. We gather at the fishing port of Lauwersoog. Some of the cars are left here and with other cars we drive to the starting point at the dike of Kloosterburen, about 23 km to the east. Here we enter the tidal flats. By crossing several tideways and circumventing muddy fields, we arrive at a tidal creek called Zuidoost Lauwers. We hike westwards along the banks of this tidal creek to another tidal creek called Spruit. Here a boat brings us to the small island/sandbar of Simonszand in about 15 minutes. There we can make a trip around the island or just take a rest and enjoy the many seals here. After about an hour we get back on board to make the beautiful trip back to the fishing harbor of Lauwersoog. • Departure place: fishing port Lauwersoog. Part of the vehicles remain standing on Lauwersoog, part of the vehicles continue to Dijksterweg 43, 9977 TD Kloosterburen (Negenboerenpolder). Hence departure. Return Lauwersoog. Pick up vehicles again in Kloosterburen. Tours by appointment for at least 10 participants: date and time after consultation at aanvraag@vrijewadlopers.nl .